Woolworths identified an opportunity to improve wellbeing within their supply chain by use of the wellbeing survey and further engagement with a specific supplier to trial the Well Supplied process. A baked goods factory, In2food Compass, was keen to participate and work with NEF Consulting on the trial. The process supported an increase of around 25% in wellbeing levels across the organisation with key benefits including a reduced risk of strike action, reduced absenteeism and improved team relations. Woolworths are now investigating the use of the wellbeing survey across a greater range of its suppliers. balance (a key component of wellbeing) and lower absenteeism. Certain teams saw significant increases in their wellbeing. Specific actions initiated through starting on the Well Supplied journey led to significant improvements in the safety of the colleagues in getting to work, as well as how colleagues treated one another. Changes to shift patterns and re-contracting of transport suppliers significantly improved the safety of workers coming to work the night shift. Techniques to recognise unfavourable patterns of communication and learning new ways to communicate helped change the atmosphere in teams from adversarial to cooperative. A reduced risk of strike action. A crippling strike by workers at an In2food Compass competitor had highlighted both to Woolworths and In2food the importance of worker wellbeing for continuity of supply and future prosperity. Evidence of the strong correlation between improved work life balance and reduced absenteeism. Teams with better reported work life balance had demonstrably lower absenteeism rates. Improved team relations. In a business where both inter- and intra-team working is crucial for success, there were marked improvements in this important component of wellbeing. Greater ownership of own wellbeing among the colleagues and greater empowerment to improve wellbeing with improvement in ‘ability to influence decisions’ seeing the largest increase of any wellbeing component. The project was first conceived when Woolworths identified the wellbeing survey as a missing piece of their supplier sustainability story. 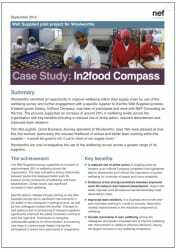 An invitation to suppliers to trial the survey led to the engagement of NEF Consulting by In2food Compass. In2food had recently purchased Compass bakery and the survey sat well with their plans to develop the culture of the organisation. At first, In2food Compass only committed to running the survey. However, at the first stage of the Well Supplied process – ‘taking stock’ – the results, along with the receptiveness of colleagues to being asked about their wellbeing, persuaded the organisation to take the process forward. “At first,” comments Johan Human, General Manager of In2food Compass, “we were a bit nervous about how they would react to the survey. We thought they might be either cynical or suspicious about our motives but, in fact, they really welcomed the opportunity. Just asking them to take the survey seemed to have a positive impact on the culture of the organisation”. The Well Supplied process provides a framework to support flourishing within organisations. Its well-defined stages progress from use of both wide and narrow diagnosis tools through to decision making and planning tools and can be used in their totality or in a modular format. An asset-based approach underpins every stage of the framework allowing the organisation to see where its own assets (skills, knowledge, abilities) can create change and where external assistance might be helpful. and served as a benchmark against which to later measure progress. The whole organisation was invited to interpret the results and bring to the fore the wellbeing issues employees most cared about at work. Visual tools to integrate views from across the organisation were then employed to identify linkages between the issues and potential intervention points. A recent In2food innovation had been to establish a democratically elected Colleague Forum to improve relations within the organisation. This Forum (through its constant communication with employees) along with management decided on the prioritization of the proposed interventions. ?Internal recruitment of an HR manager – to review pay scales and improve communication throughout the organisation. Training in non-violent communication (NVC) for managers – for improving inter-personal communication. 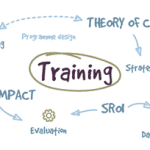 Training in unwritten ground rules (URGs) – for improving organisational communication. actors were employed, for example, after the initial delivery of the NVC training, the use of peer mentoring. Working with an organisation committed to wellbeing substantially improves the speed of change and future sustainability of the well supplied process. Co-production both in the design of each stage and its execution is critical in creating ownership and empowerment of the process within the organisation, key components of wellbeing. In2food have now committed to having team level wellbeing conversations to further develop interventions that can continue to increase the wellbeing of the organisation. Woolworths has learned how subjective wellbeing can give a deeper understanding of the quality of their supply chain’s experience. Well Supplied is a flexible process that can be adapted to the different needs of clients. It is centred on capacity building and coproduction of solutions and can therefore be implemented internally by the client.